The ADHD news has been afire lately with a growing body of research showing that ADHD medications do not improve academic outcomes. You know, I’m not surprised by the research, and frankly anyone who reads into the results shouldn’t be too surprised either. ADHD medications are not a take 2 and call me in the morning type of treatment, and clearly not a cure for ADHD by any means. 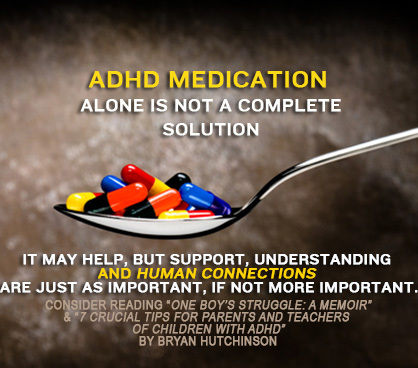 One of the reasons I wrote 7 Crucial Tips for Parents and Teachers of Children with ADHD is because medication alone isn’t a complete solution and the research is showing how true this really is. ADHD medications in my opinion are an important, and for some, an integral, necessary part, but not the complete and total, it’s done, cured, kind of treatment. Giving a child ADHD medication (I am talking about the perfect scenario where medication works and is the perfect dose and calms the child down), doesn’t mean the child is suddenly going to have better academic results. And why should it? Because the child can focus better? He or she may be more manageable in the classroom and less likely to act out, but the medication does not pick what the student will focus on. Medication does not pick what the student will focus on or what the student is interested in at any given moment. Despite what some might hope, kids on ADHD medication do not become robots when told to go study alone in their room and then should return for dinner when completed. The kid might well go to his or her room, but get focused instead on making his or her bed and cleaning the room, because the medication never chooses for the child to open books and study. And that’s the core issue. ADHD medication alone is not the answer. If you’ve read my memoir One Boy’s Struggle you know that I was a quiet child, because as an inattentive type I did not burst out in classrooms or fidget a lot and that’s one of the reasons why I was not diagnosed. My teachers were not as concerned with my academic results as much as they were with me being such a good, quiet boy. ADHD medication may make a child more obedient and seemingly disciplined, but it doesn’t have a magic switch in the brain that makes a child focus on what a parent or teacher wants the child to focus on. Children still need help to learn what the right choices are and how to make them. I know, it seems like a no brainer, but you have to ask yourself how many kids are given ADHD medication and are not given the support on how to manage their ADHD symptoms? ADHD medications are like tools, but even tools must be used in the manner that best suits each one, and if they are not then they are just a bunch of great tools with no specific purpose and will be used on anything, and not even effectively at that. What’s to stop an ADHD child using medication from focusing on a butterfly instead of studying for their next exam? The medication doesn’t make the choice for the child, but a parent or teacher sitting down with the child and assisting him or her can help direct the child’s focus. 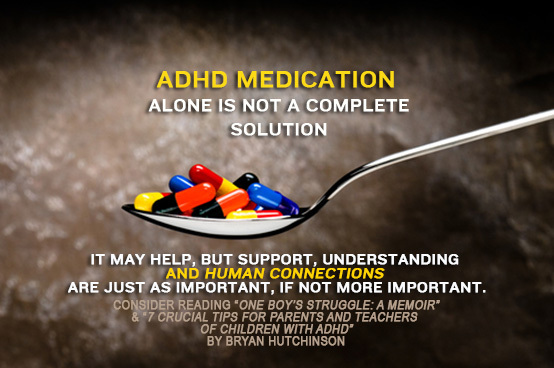 ADHD medications can help, but are not going to replace the personal nurturing a child with ADHD needs. If ADHD medication continues to be used without the proper support and teaching skills to back it up, then the research showing ADHD medications do not improve academic outcomes will likely continue. Let’s not blame medication for lack of better outcomes. Now, here’s another thing and it’s important even if it starts a debate. Why have so many successful people with ADHD chosen not to take medication? What has been different for them? SUPPORT from other human beings, parents, teachers, coaches and mentors. Medication will never, never replace human connections, nurturing and support. But I do believe medication along with the support a child needs can be a winning combination and human connection and support without medication is a realistic alternative, but takes a lot of time, care, and work. But, hey, didn’t we know that already? As I shared in One Boy’s Struggle, my life dramatically started to improve when I found a mentor. And I still do not (and cannot) take medication to treat my ADHD. If you’d like some ideas on how to best support a child, 7 Crucial Tips for Parents and Teachers of Children with ADHD is filled with tips on what I believe would have helped me as a child and judging from the reviews it is helping a lot of parents and teachers, and even adults with ADHD, too. If you’d like to meet other parents dealing with these issues concerning kids with ADHD, check out my friend Rory Stern’s Facebook page Helping Your Child With ADHD – there are over 11,000 parents and teachers sharing a vast amount of knowledge and first hand experiences there. What do you think of the human connection part of ADHD treatment? Is it being lost? Share in the comments.